Since Parley started in 2012, many things happened. In our first issue we spoke about your strong relationship with Sea Shepherd Conservation Society, the NGO founded by Paul Watson to protect the animals and the oceans.What today is the main goal for Parley? When we started Parley, the accepted deadline for the collapse of oceans, the year all sea life as we know it would cease to exist, was 2048. That was an optimistic estimate. Now we know we have just10 years to turn things around, to turn us around. Our main goal is to make sure we are fast enough to meet that deadline — and our approach is through exploration, conservation, and eco-innovation. You have been focusing a lot on plastic pollution in the oceans, a strong topic that should worry most of us due to the dimension of plastic. Since you started Parley, how your life changed, how all the informations you got about the conditions of our oceans affected your lifestyle? We decided to focus on plastic pollution first because it’s something tangible, something we all can see and feel and understand in our daily lives. Plastic is like a drug. We’re completely addicted, yet have this false detachment from its impacts. The environmental threats we face feel distant only until you witness a bleached coral reef or a remote island covered in a belt of trash. Once you learn that plastic never biodegrades, what it does to sea life, to our own health when it enters our bloodstreams, it changes your mindset. Taking action becomes common sense.I’ve always seen opportunity in destruction. Starting Parley gave my career purpose, and a new definition of success. Parley in 2015 during the COP21 in Paris organized a big event at the Hotel Les Bains to focus the attention of the media on how to respect our world. But as most of us are not used to thinking about the pollution effect you raised attention in a cool way, starting a collaboration with Adidas. How did you choose them, and how you have been able to convince such a big industry to jump on your project? Adidas for us was always the perfect partner. They have a strong culture of collaboration and innovation, and they have the reach to make a real impact. But it’s not just about creating products. As a founding member of Parley, adidas is fully committed to the cause and implementation of our AIR Strategy. Since we announced our partnership, adidas has phased out the use of plastic bags in their retail stores and banned the use of microbeads in licensed personal care products. 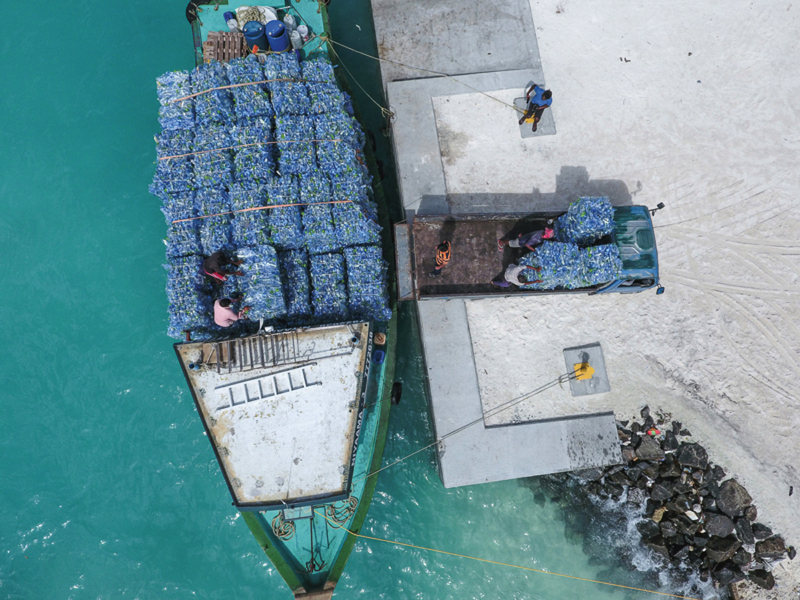 They are educating their employees and support us in developing systems to intercept plastic from marine environments and return it to the supply chain as Parley Ocean Plastic. And they are redesigning not only products, but the entire supply chain — gradually phasing out virgin plastic and replacing it with Parley Ocean Plastic while we continue to work towards long-term solutions. The shoe we launched in November2016 is still only the beginning of this journey.Parley is focused on finding solution to defend our oceans and engage people to be more aware about how bad is the situation of our planet, working with big industries which are able to spread the message all around the world. Can we say that you want to send the message that you can be cool, stylish and in the same time an activist? We need to stop stereotyping environmentalists as these militant activists out to assign blame and crucify the guilty. If you’re not “an environmentalist”, then what are you? Anti-survival? We all share this responsibility to safeguard our future. The creative industries are the best crusaders for the cause, because they are the ones who mold reality. They can lead the resistance. And eco innovation will be their protest.It’s not new the fact that some brands are interested to produce sustainable products to engage more clients, and less because they are really into changing the world. How do you choose your partners to avoid the “brand washing” phenomenon? Our network is made of partnerships, not marketing campaigns. We have to be strategic when selecting whom we partner with and which initiatives to take on. The brands in our network don’t just commit to action, they adopt our AIR strategy and ingrain our way of talking and thinking about sustainability — eco innovation— within their culture. Many of the issues we face stem from a systemic breakdown within dated business models, perpetuated because companies have become detached from their supply chains and from the decision-making processes that deem how and why and from what a product is made, marketed, sold. You can’t fix big problems if decisions are made within silos. A brand is a complex ecosystem of its own capable of evolving and adapting at the scale and pace we need, but only if the change is authentic and coming from within—from the people. Part of our strategy is making sure the employees of our partners are educated and empowered to drive the change. One way we achieve that is through Parley Ocean School. Adidas is one of your main partners on creating revolutionary ideas and projects, and recently you reached a great audience: I’m speaking about the collaboration with 2 of the most famous football clubs in the world, Real Madrid and Bayern.Can you speak about this collaboration and how you had the idea to create revolutionary jerseys for the teams?The launch of the Parley jerseys for the world-renowned football clubs Real Madrid and Bayern Munich marked a milestone moment for the adidas x Parley partnership. These jerseys were made from up cycled plastic pollution intercepted in coastal areas of the Maldives. With this release, we showed that we can create high quality performance products using a replacement for virgin plastic:Parley Ocean Plastic. This is just another step on the journey.the Parley Ocean Plastic kits were a tribute to the oceans, and the fact that the two clubs used them to play on pitch allowed us to reach and engage a new audience, as did the support of Marcelo, Alonso and Zidane. At this point, though, it’s no longer just about raising awareness. We need to take action and implement strategies that can end the cycle of plastic pollution for good.Do you think that other football clubs are going to join this project to raise attention on the water pollution issue? Eco innovation is an open playing field. Everyone — every consumer, player, team and fan — is invited to own their impact under ParleyAIR and define their role within the movement. Purpose is the new trend and sports clubs, businesses, and anyone in the public eye will need to get on board if they want to stay competitive and relevant going forward.What’s next for Parley? There is any new big project coming out, and what we should be worried about today? Do you think that the trend is changing and people are more aware today about the situation of the planet? People fear what they don’t know. And for many, the ocean is one great unknown stretching towards the horizon. We see a vast blue carpet, not a living ecosystem housing 99% of the biosphere. Our aim is to help people connect to the sea—or reconnect the source—by getting them to think beyond surface level. Sometimes literally so.You need to get your head underwater. I think people are becoming more aware of the situation. But they don’t “get it” in a way that inspires action. And we can’t fault them for that. People have a lot to worry about, especially now. We need to meet awareness with action, and provide realistic ways for people to participate in the solutions. Step one is falling in love with the oceans. You can’t do that with horror stories. You have to rally for the beauty and show people what’s possible. This article has been published inside our print magazine issue 3. You can buy the print edition at our on line shop here.